In a little over a month the Cutter Consortium will publish a special issue of the Cutter IT Journal (CITJ) on Technical Debt. As the guest editor for this issue I had the privilege to set the direction for it and now have early exposure to the latest and greatest in research and field work from the various authors. This short post is intended to share with you some of the more exciting findings you could expect in this issue of the CITJ. 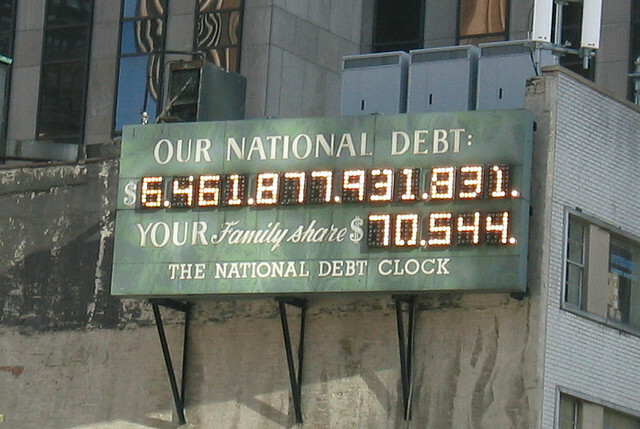 The picture above of the debt clock is a common metaphor that runs through all articles. The various authors are unanimously of the opinion that one must measure his/her technical debt, embed the measurements in the software governance process and relentlessly push hard to reduce technical debt. One can easily extrapolate this common thread to conjecture an initiative by Vivek Kundra to assess technical debt and its ramification at the national level. One of the authors focuses on the difference between the manifestation of technical debt in dev versus its manifestation in devops, reaching the conclusion that the change in context (from dev to devops) makes quite a difference. The author actually doubts that the classical differentiation between “building the right system” and “building the system right” holds in devops. Another author derives formulas for calculating Recurring Interest and Compounding Interest in technical debt. The author uses these formulas to demonstrate two scenario: Scenario A in which technical debt as % of total product revenue is 12% and Scenario B in which technical debt as % of total product revenue is 280%. The fascinating thing is that this dramatic difference (12% v. 280%) is induced through much smaller variances in the Recurring Interest and the Compounding Interest. I will blog much more on the subject when the CITJ issue is published in October. In addition, Jim Highsmith and I will discuss the findings of the various authors as part of our joint seminar on the subject in the forthcoming Cutter Summit.